The Wayward Prince – now available! November 13, 2018 / hannadare / Comments Off on The Wayward Prince – now available! Woo hoo! We have launch on a brand new spaceship-powered romance! The Wayward Prince is now live and available for you to purchase on Amazon or read for free through a Kindle Unlimited subscription. I hope you enjoy this next instalment in the Mind + Machine series. It follows the events of Machine Metal Magic but can be read as a standalone. If you ever watched the show Firefly but wished it was a lot more gay then this is the series for you! 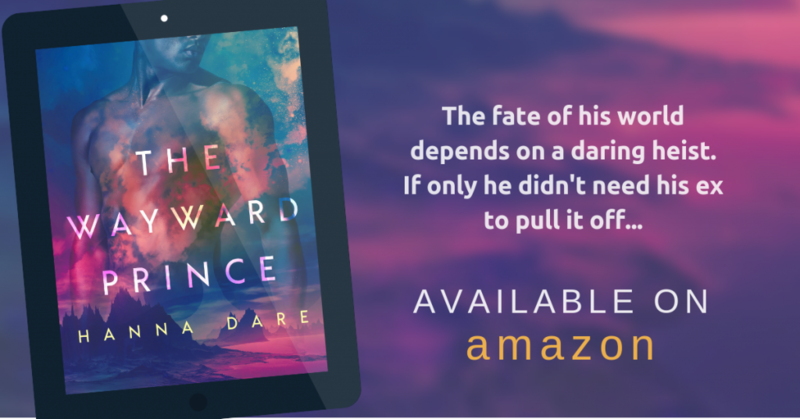 The Wayward Prince has action, a daring heist, slow burn romance, and a second chance at love between a ship’s captain with flexible morals and a man torn between his duty and his heart. There’s also a literal cliff-hanger — but don’t worry, it’s not at the end!